I am considering purchasing one of these two saws. Either the Ridgid 10” R4513 or the R4512 table saw. I know that the 4512 is closer to a cabinet saw as far as the base is concerned. What I am considering also is the price difference. There is about a 200 dollar difference in the two. I need to know what you all think of the working quality between the two. Is there that much of a difference between them to merit the higher price? For a home/garage type shop, 4512 hands down is the better choice. The 4513 is more of a portable job site saw. The 4512 has a better fence, cast iron table and a belt drive. All worth the extra dough. If you’re a contractor and need the portability, you’ll have use for the 4513. If you don’t need a super portable saw, don’t get one… you give up too much for the sake of portability – lots of plastic, a universal screamer motor that will fall over and die when pushed hard, less weight, smaller table, etc, etc, etc..
You give up a lot for the sake of portability. A good stationary saw will have nearly every advantage in terms of duty rating, materials of construction, table surface, space in front of the blade, mass/stability, reliability, torque, aftermarket accessories, ease of use, feasibility to fix, etc. 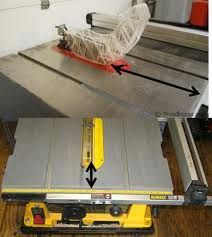 A portable saw has a plastic housing with the equivalent of a circular saw hung under an aluminum or composite table. A stationary saw has a steel housing with a belt drive induction motor supported by a cast iron structure….it’s much quieter, stronger, more reliable, and has a lot more torque. The biggest benefit of a portable saw is portability….they can be made to work, but if you’re not lugging it from jobsite to jobsite, it’s not worth giving up all the other benefits IMO. Does anyone on the forum have a Ridgid R4512 that you have used a while that you can tell me how you like it and weather you would buy it again or recommend it to me. There’s been a whole lot written about the 4512 on this site. Check out some user reviews here. The history of the R4512 is less than stellar. I ended up buying the Delta 36-725 because of the amount of negative reviews on the Ridgid R4512. That’s not to say the newer ones are not okay. Definitely go with the R4512 over the R4513 if those are your choices, unless you need the portability of the R4513. Thanks for the help. I am checking my options. I have one that I have had for several years. I have used it quite a bit. It came with a combination blade so I bought a Freud fine cut to have also. I also have a nice Freud dado set. I made a crosscut and a dado sled for it. I took my time setting the saw up when I got it and have enjoyed it a lot. One nice thing is that the motor doesn’t hang out on the back which takes up more room when trying to store the saw. My last TS was a Delta with a 2HP motor. It was made well but I didn’t like it nearly as well as the Ridgid. I can honestly saw that I have enjoyed using the 4512. Im just a hobby woodworker and it will do about anything I need a table saw to do. The mobile stand is great. Only one thing about the saw that I wish was made a little different is the depth of the insert area. It is very shallow and trying to make insert plates was tricky for me. Now they can be bought for the 4512. Overall, I give the (my)4512 a thumbs up.